Use Summary Blocks to display your content (blog posts, products, gallery or project images, or events) in a variety of layouts. 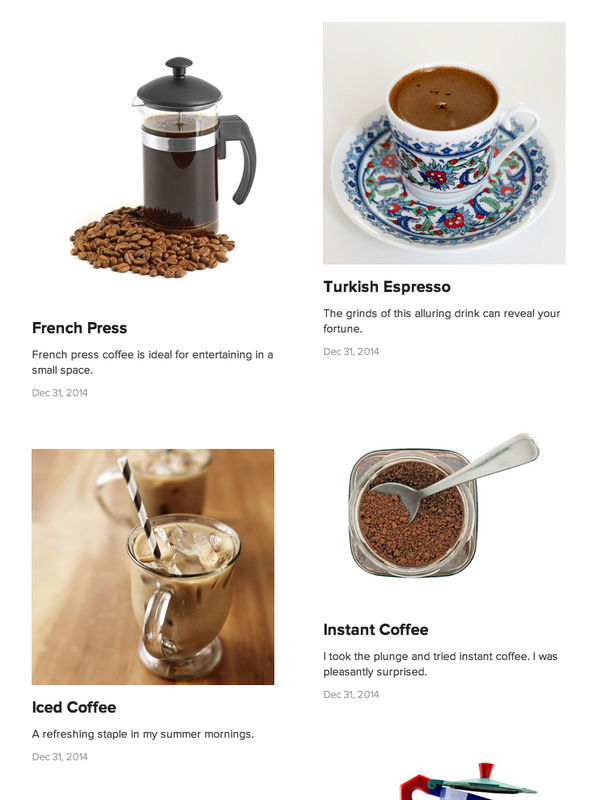 Highlighting blog posts, gallery images, events, or products on your homepage. Displaying products or blog posts in a layout that isn't available in your template. Alterar o layout de seu conteúdo, sem fazer mudanças drásticas de estilo. 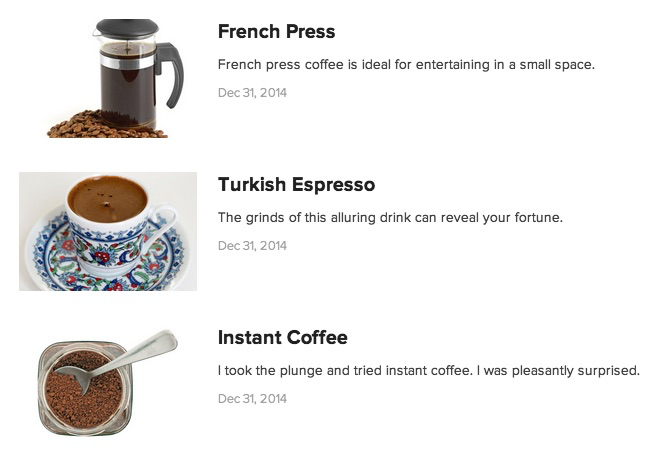 Adding links to related content at the end of a blog post or product item page. Creating recipe or content indexes. Tip: Summary Blocks pull content from other pages. Before adding the block, add content to a Blog Page, Events Page, Gallery Page, Products Page, or Project Page. It's not possible to add content directly to a Summary Block. For the best display, add thumbnail images to every item that will display in the block. 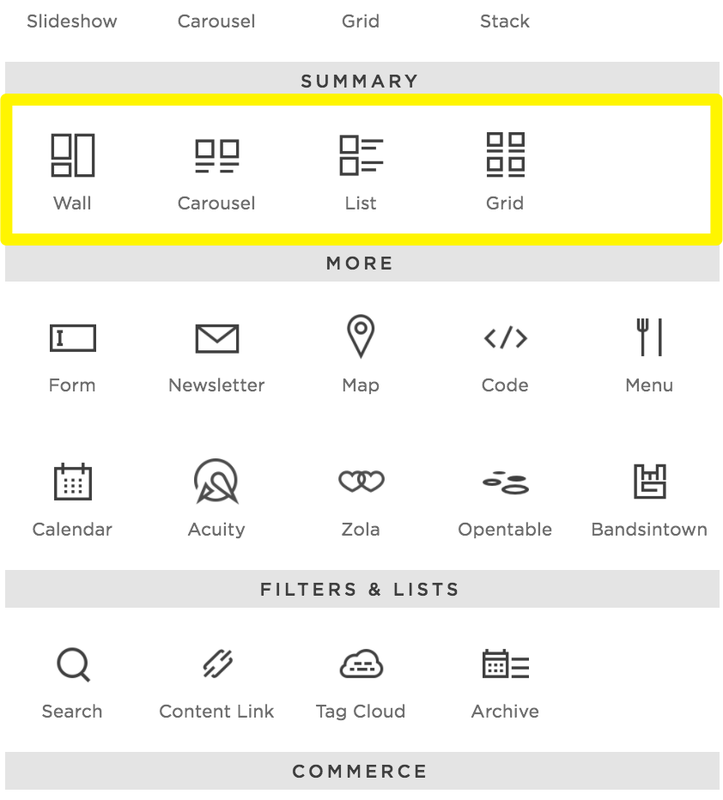 Under Summary, select Wall, Carousel, List, or Grid. Use the Content tab to select your content. Use the Layout tab to change the layout and edit layout settings. Use the Display tab to set how content displays in the block. Você só pode apresentar conteúdo de uma página no Bloco de Sumário. No entanto, você pode adicionar vários blocos a uma página, para apresentar todo o conteúdo que quiser. You can change the page that Summary Blocks pull content from at any time. Páginas de Álbum não são compatíveis neste momento. There are four Summary Blocks, and their behavior is consistent across all templates. 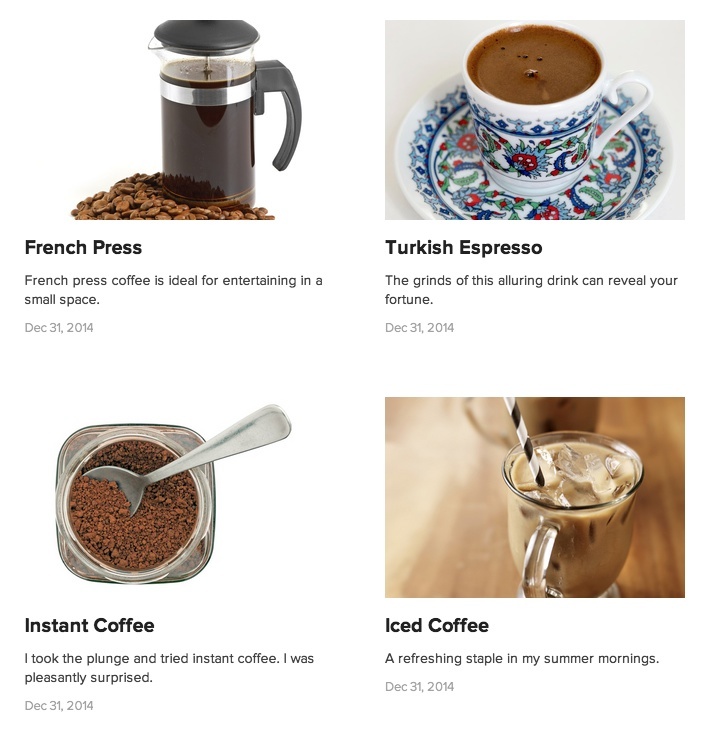 Here are examples of blog posts in each layout. You can change the layout in the Layout tab of the Summary Block. As you select a layout, you'll see a preview of it on the page. Wall Summary Blocks display items in a masonry style grid. Unlike the Grid layout, which displays items in even rows, the Wall layout displays items in offset rows based on the size of the content, creating a mosaic look. Carousel Summary Blocks display a set number of items in a row, with navigation arrows in the top-right corner for scrolling through more content. List Summary Blocks display items in one column with thumbnail images on one side and text on the other. Grid Summary Blocks display items in an even grid. Items with uneven lengths have space between them. In the Layout tab of the Summary Block, you can customize the size of and space between items. As you adjust the settings, you'll see a preview of your changes on the page. Your options depend on the layout. Column Width Adjust the width of columns in the block. This changes the number of items per row and the size of each item. Adjust the space/padding between items. Text Size Set text to display Extra Large, Large, Medium, or Small. These settings affect the title text. The Extra Large setting also affects excerpt text. Align text to the Left, Right, or Center of each item. Metadata Position Set the location of the item metadata, like a date or author, to Above Title, Below Title, or Below Content. Select the type of metadata that appears in the Display tab. Add a custom title to display above the block. This way, you can avoid adding a separate Text Block. Select the aspect ratio for thumbnail images, which affects cropping. Select Auto to display thumbnails without cropping. Select the number of items to display at a time. You can select between 1 and 5. Set text to display Extra Large, Large, Medium, or Small. These settings affect the title text. The Extra Large setting also affects excerpt text. Text Alignment Align text to the Left, Right, or Center of each item. Set the size at which the items display. You can set the items to appear between 10% and 80% of the total width of the list. Align images to the Left or Right of the text. Text Alignment Align the text to the Left, Right, or Center. Note: Gallery Page images in this layout open in lightbox slideshows. Clickthrough URLs disable the lightbox. Column Width Adjust the width of columns in the block. Note: Items in Grid Summary Blocks are left-aligned, and a narrow Column Width may cause extra space on the right side of the block. Gutter Width Adjust the space/padding between items. Set the location of the item metadata, like a date or author, to Above Title, Below Title, or Below Content. Select the type of metadata that appears in the Display tab. Tip: Summary Block caption styles are set by the template. In the Display tab of the Summary Block, you can set what content displays and how. As you adjust the settings, you'll see a preview of your changes on the page. Set the number of items to display in the block. You can display up to 30 items. Set the item titles to display in the block. Uncheck to hide the item titles. Set the item thumbnail images to display in the block. Uncheck to hide the item thumbnail images. Set the item excerpts or descriptions to display in the block. Uncheck to hide the item excerpts or descriptions. When displaying blog posts, the excerpt displays in the block. When displaying events, gallery images, project images, or products, the item description displays in the block. Depending on the item, you can select Date Posted, Category, Tags, Author, Location, Comments, or None. Placement of this information varies by layout. If an item doesn't have the metadata you select, it won't display with the item. For this reason, we recommend filling out all boxes in every blog post, event, gallery image, or product if you want this information to display in the block. Se você só quer exibir o conteúdo de uma determinada categoria, insira o filtro da categoria nesta caixa. Recomendamos adicionar categorias para todos os itens, se você quiser que essas informações sejam exibidas. Se você quiser exibir apenas o conteúdo com uma determinada tag, insira o filtro de tags nesta caixa. Recomendamos adicionar tags a todos os itens, se você quiser que essas informações sejam exibidas no bloco. Use this option if you want to use the Summary Block to promote or display featured posts. Para que isso funcione, as postagens que você deseja exibir no bloco deverão ter Featured Post (Postagem em Destaque) marcado na aba Options (Opções) no Blog Post Editor (Editor de Postagens de Blog). Nota: O Bloco de Sumário não pode abrir itens em uma nova janela. Para abrir imagens em uma nova janela, considere usar o Bloco de Galeria, em vez disso. Depending on the type of collection items you display in your Summary Block, you may see additional options. Show Read More Link - When checked, "Read More" links display under post content and above metadata. Event Timeframe - Select which events to display in the block: past events or upcoming events. To display both past and upcoming events, add two Summary Blocks with their own Event Timeframe selected. Show Price - When checked, product prices appear under product titles. Enable Product Quick View - When checked, enables Product Quick View.